Welcome to our online collection of original Harper's Weekly newspapers. These papers have important illustrations, and first hand accounts of the key events of the war. Study of this material yields a new understanding of the war. You are viewing a stunning image of a Civil War Battle created by Thomas Nast in 1864. The image is captioned, "The Campaign in Virginia, - On To Richmond!". 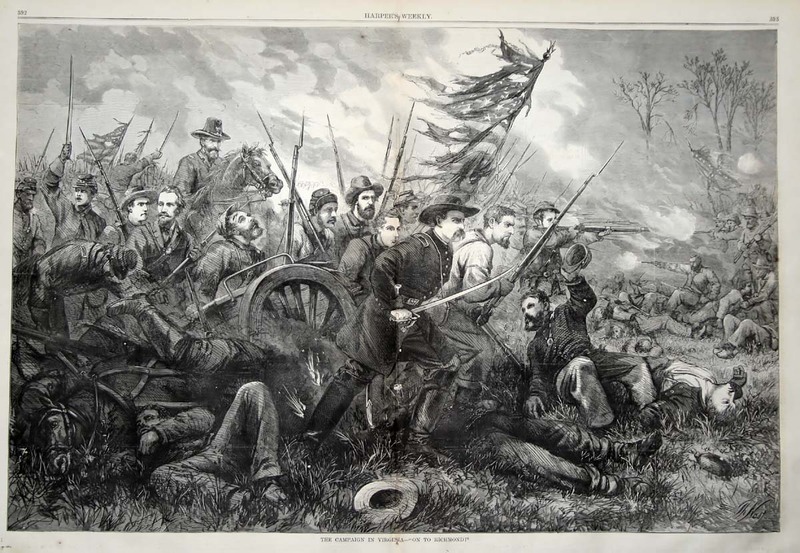 The illustration shows a dramatic view of a Civil War Battle. It reflects the growing confidence in the North in the middle of 1864 that they had turned the corner and could win the Civil War. The picture shows a determined group of union soldiers marching forward. The Union Flag is tattered, but is still proudly flying over the unit. The soldiers march on, even as their comrades are falling by their side. The original 140+ year old leaf used to create this page is available for a contribution to this site of $250. The original leaf is 16X22 and would make a stunning display when framed and placed in your office or study. Your contribution will allow us to continue to expand the free educational resources on this site.